"Turn your head and cough." "OK, now, stand pigeon-toed and rest your forearms on the table." Every guy that hears these words from a doctor dreads them. I'm sure the lady readers of this blog have their own set of doctor directions that you despise as well! I'll be honest with you. I have been somewhat negligent with my health. I haven't always taken the best care of my body that I probably should have or could have. Thankfully, up to this point and time in my life, I haven't had any major health scares or problems. I have been blessed with healthy genes and only the occasional cold or flu bug once or twice a year. Because I've been relatively healthy over the years (praise God), I have failed to do the "routine maintenance" on my body that I should have been doing. I have to embarrassingly say that it's easily been a least 20 years since I have been to the doctor for a routine physical exam. Sure, I've gone to clinics to get medication for flu bugs and sinus infections; or I've gotten physical exams for insurance purposes, but it's easily been a couple of decades since I had a solid, comprehensive exam. How crazy is that? Probably more like, how dumb am I? Because of recent changes in my life (mainly the fact that I'm now over 40! ), I felt that it was time to get off my backside and stop neglecting this important area. So, I finally scheduled a routine physical exam and went to see the doctor a couple of weeks ago. Thankfully, my doctor said that I'm a boring patient and he saw no evidence of any health concerns up to this point. I'm so grateful that my stupidity and neglect hasn't caught up with me after twenty years! In the opening of John's third epistle, we see his concern for the health of his friend Gaius. John had been praying for prosperity in life, and good physical health that matched up with his spiritual health. Interesting verse. Almost sounds a little health, wealth, and prosperity gospel, doesn't it? In these verses, Paul stresses the importance of spiritual training over physical training. But, he still states that there is SOME value to physical training. Mental, emotional, spiritual, and physical. These key areas are what make us uniquely human. As Christians, growth in the spiritual area should be our primary emphasis, but we're going to have difficulty focusing on that spiritual growth if we're physically sick all the time or struggling with mental and emotional problems. We need to strive to be healthy in all these areas. My boss at church often makes the statement that the Lord knows when it will be our unique time to depart this earth for heaven, but we can actually "go before our time" through neglecting our physical health. While as a Christian, I often feel the pull toward my eternal destination over the problems of this mortal life, I don't want to depart this life for the next earlier than God's timetable just because I've been sloppy with my health. I want to see my children grow up, get married, and have children of their own. If God blesses me with an extraordinary long life, then maybe I will even live long enough to see great-grandchildren! More importantly, though, I want to stay physically fit and active for the purpose of fulfilling God's Kingdom purposes for me here on earth. Plus, I want to have the physical energy that it's going to take to fulfill His mission for me. As a result of these recent stewardship revelations, I'm working out 3-4 times a week. I'm taking supplements to support a healthier body. 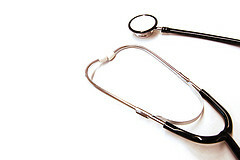 Finally, I'm going to do the regular doctor check-ups in order to maintain a healthy lifestyle that pleases the Lord. He's only giving me one life and one body. He's expecting me to be an extraordinary manager of what He's blessed me with. How about you? Have you been neglecting your health like I had been? Do you need to make some major life changes in order to get back on track toward a healthier lifestyle? I would encourage you to begin taking some "baby steps" toward getting healthier. This could be anything such as working out for 10 minutes a couple of days a week, eating healthier foods, or scheduling a physical exam. Don't get overwhelmed and paralyzed by trying to do a bunch of things to get healthier all at once. Build brick by brick, one healthy habit, one healthy decision at a time, until you reach your desired destination.